With the new Zelda fast approaching, it looks like Nintendo is revamping one of their franchise’s iconic gameplay and structure by eyeing open worlds like Skyrim. In my perfect world, big N would do the same with Metroid and would use Crystal Dynamics most recent games as inspiration. Non-linear worlds, growing abilities, exploration, and a great heroine. Thirty years ago, that would have described Metroid - today it describes Tomb Raider - another but by now not less iconic series. While Uncharted is more linear and story focused, the new Tomb Raider games incorporate a more Metroidvania style gameplay. You can backtrack and revisit areas, find secrets and optional areas. You gain new abilities via tools and even have a skill-tree. The more I played Rise of the Tomb Raider, the more I realized that this gameplay was the perfect next step for Metroid. I am a huge fan of the Metroid Prime series. Retro Studios managed to bring a beloved franchise into the third dimension, keeping the amazing alien tone and putting the feeling of being Samus front and center. Step by step you explore ancient ruins and alien landscapes, gain new abilities and use these to face the hostile environment and progress. The story is not served by cutscenes (with a few exceptions) but told through the items that you find and inspect - a different way of narrating the player’s experience. A deep sense of space and immersion is part of the tone, the revisiting of intelligently designed areas anchors the player like no Uncharted-corridor level can. Changing the location from space to earth, Crystal Dynamics’ Tomb Raider games are quite similar to that: Exploring valleys, ruins and caves, encountering the local flora and fauna and figuring out how it all is sometimes deadly, sometimes helpful. While the player is still put on a relatively linear story, the levels themselves allow and encourage the player to explore every nook and cranny of them. You find artifacts and scrolls, records of who was there before you. It’s not just another Tomb, it’s a place with history. 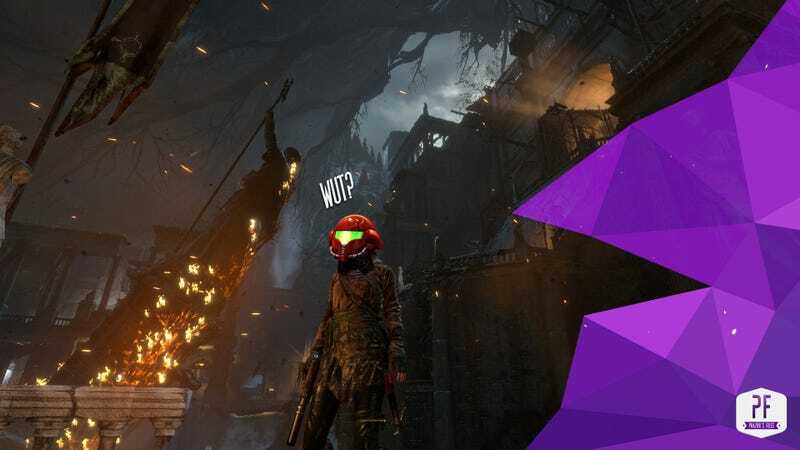 Rise of the Tomb Raider’s artifacts and records are similar to the Scan mechanic of the Metroid Prime series: they are not just mere collectibles, no. They tell a story, another side of the place you are traversing. It gives the world it’s purpose, and the player discovers his part in it. When people hear the term Metroidvania, they usually think of 2D games. But interconnected and revisitable areas, optional levels that offer skill- or upgrade rewards, puzzles, and the likes work in 3D as well - and they all have been there before in Metroid Prime. With the only major difference being in the third person perspective, Tomb Raider reminds us all how this gameplay fits perfectly in a modern triple-A game. I personally love the immersion this kind of game brings with it, and I just hope that for its next generation Nintendo is willing to put the Metroid back in Metroidvania.